Traditional Moroccan cement tiles, also known as encaustic tiles, are created using cement, marble powder, and natural pigments in an artisan manufacturing process that hasn’t changed since the tenth century. Since they are made of cement and not ceramic, the tiles do not need to be fired. Instead, they are formed with a hydraulic press and mould and then air-dried, a process which clearly uses much less energy than traditional firing. Cement tiles are extremely durable, easy to clean, non-flammable, non-polluting, recyclable, and naturally insulating, helping to keep surfaces cool in the summer and warm in the winter. And of course, they’re absolutely beautiful! Our Traditional Moroccan cement tiles are available in many different solid colors, patterns, and borders. The standard thickness for all encaustic cement tiles is 15/20cm. All our encaustic cement tiles come in a soft matte finish. Cement tiles are completely hand made. The color layer is prepared in batches and every component is weighed in order to guarantee color consistency. The color is mixed in a horizontal mixer that guarantees the homogenization of the mixture. The color is then mixed with water and hand poured into the different molds. The thickness of the color layer will always be between 3 and 5 millimeters. Two layers of cement and sand are poured on top of the color layer and then the tile is pressed using a hydraulic press. left to dry for 10 days and then hand inspected. Tiles are ready for shipment 28 days after they have been manufactured. At this stage the cement in the body and the color surface will have obtained 98% of its ultimate strength. 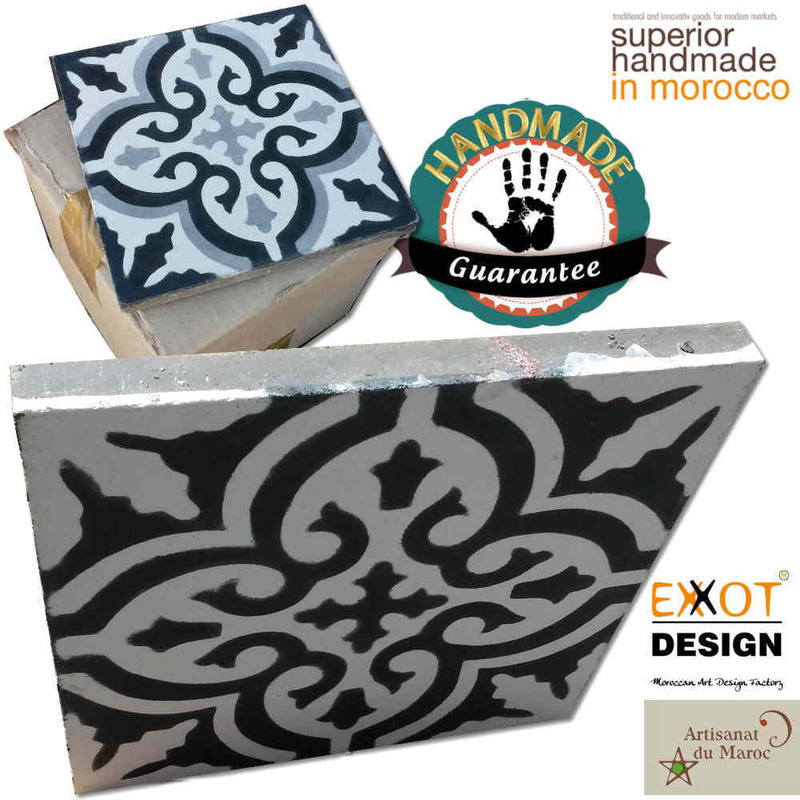 All our Original Moroccan Cement tiles are 100% handmade piece per piece.